GoreGoyles is a series of DVDs that spawned two films. The concept was to present the best independent horror short stories from around the world as an anthology. Each GoreGoyles film showcases two stories. GOREGOYLES: MUTANT EDITION presented THE HOLY TERROR and BEAST. GOREGOYLES: BACK TO THE FLESH presented THE WALKERS and a shorter version of Alexandre Michaud's CLEAN. Wrapped with introductions and special features hosted by a strange character called Uncle Vicious (Éric Therrien), the GoreGoyles series takes fully advantage of the DVD medium in a very innovative way. Stories directed by such up and coming filmmakers as Alexandre Michaud, Miles Finlayson and Augustine Arredondo. Initial US DVD release: GoreGoyles: Mutant Edition, released as GoreGoyles: First Cut - Brain Damage Films, 2003. US DVD re-release: GoreGoyles: Mutant Edition - Brain Damage Films, 2007. US DVD release: GoreGoyles: Back To The Flesh, released as GoreGoyles 2. - Brain Damage Films, 2007. Russian DVD release - GoreGoyles: Mutant Edition, 2008. Russian DVD release - GoreGoyles: Back To The Flesh, 2008. US DVD packaged re-release: GoreGoyles: Mutant Edition & GoreGoyles: Back To The Flesh, Released as part of Catacombs of Creepshow movie pack. - Pendulum Pictures, 2008.. US DVD packaged re-release: GoreGoyles: Mutant Edition, released as part of Drenched In Blood 4 movie pack. - BCI Eclipse, 2005. 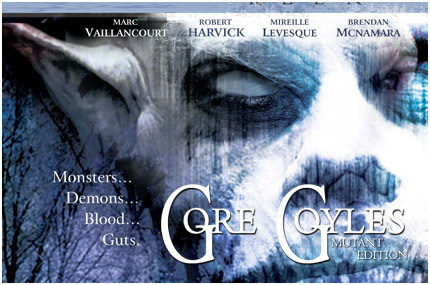 Canadian DVD release: GoreGoyles: Mutant Edition, released as Gore Goyles with French subtitles. - Black Flag Pictures, 2011. Droits de distribution pour GOREGOYLES: MUTANT EDITION et GOREGOYLES: BACK TO THE FLESH sont disponibles dans quelques territoires.